No, I mean, I really like seltzer. I go through it like it was water. (But with bubbles.) I throw back about two or three liters of the stuff a day. No flavoring, of course; just plain old water and carbon dioxide. We used to buy one-liter seltzer bottles by the case. (We wouldn't buy two-liter bottles, because they lose their fizz by the time they're half empty.) But our seltzer tab would quickly add up, even at a wholesale club. Plus you had all those environmentally insensitive plastic bottles you had to recycle. Plus, cases of seltzer are heavy — each bottle weighs a kilogram (that's the weight of a liter of water, FYI), so each case weighs about 26 pounds. Then we hit upon a solution: we got our own seltzer machine. You get reusable plastic bottles, add filtered water, and use the machine to pump carbon dioxide into the water. The company, Sodastream, then delivers more carbon-dioxide cylinders and picks up your empties. If you like seltzer as much as I do, I recommend this. But here's something I've noticed about my own soda-pumping behavior. (Finally, a point coming.) As I get to the end of my supply of CO2, I start to get stingier with my pumps. 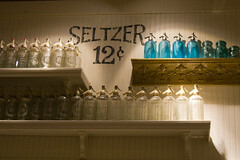 I prefer my seltzer on the fizzy side, so I usually give it six or seven pumps per bottle. But as I start running out of gas, I'll be more parsimonious with my pumping — I'll try to get away with maybe four or five shorter pumps. I was doing that this past weekend, as I waited for my newly filled cylinders to arrive. Yesterday, my cylinder replacements showed up, and since then, I've been gassing up like nobody's business. Now think about that: there's no physical difference between the gas at the beginning of a shipment and the gas at the end of a shipment. It's not any gassier. It costs exactly the same per CO2 molecule. Yet I use the gas more sparingly when my shipment's running out than I do when I've just gotten a fresh supply. Why? Another example: There are 162 games in a Major League season. Whether you make the playoffs depends on your won-loss record at the end of the 162-game season. To make the playoffs out of the AL East, my beloved Red Sox probably have to win 97 or 98 games (looking less likely as they suffer yet another injury to a key player). Only the number of wins matters, not when they occur. A win in the first week of April is worth exactly as much as a win in the final week of September. Yet anyone involved in baseball will insist that wins are more important in September. Theoretically, then, players will bear down and try harder to win late in the season. And what does that have to do with billable hours? Plenty. What the Last-CO2-Cylinder Phenomenon and the September-Baseball Phenomenon show us is that scarcity (of gas, of games left in the season) makes us value the scarce thing more, and make us spend the thing more carefully (pump less, try harder to win). A lawyer who bills hours has no scarcity. All the hours are equal, because there is an unlimited supply of them (at least until the client squawks). A young associate never feels like a ballplayer in the fall, or me at the end of my carbon-dioxide supply. She's never going bear down (or pump parsimoniously) because of the scarcity of hours. On the other hand, for the lawyer using Open Pricing (fixed pricing), all your time is scarce. You always have to bear down. You always have to use your fizz wisely. When you're not billing hourly, it's always September baseball. What do you think? Not buying that billable hours = fizz? Tell me why in the comments below.